Fridays are usually when Across the Bored highlights art and artists but today is somewhat different in that Travel. Garden. Eat. has graciously presented us with the Liebster Award! 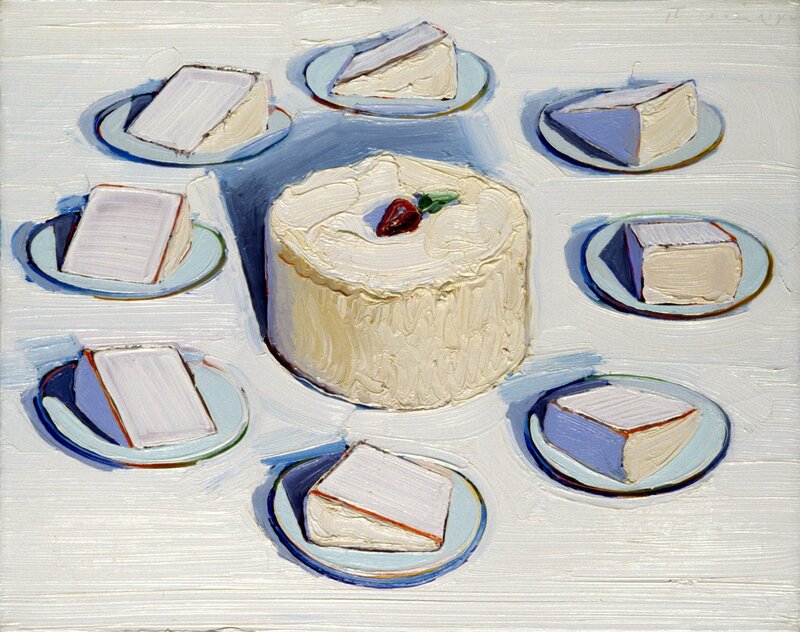 Around the Cake by Wayne Thiebaud – one of the penultimate painters of common objects – is a sweet offering to express my gratitude to Kat and all those who read, comment, follow and inspire me with something new on a daily basis. A place you have never traveled to that is on your travel bucket list? Book you are currently reading? The owner’s manual to my camera. Morning bird or night owl? Both, it depends on whether the Professor is home. Which movie can you watch again and again? Priscilla Queen of the Desert. One of your favorite quotes? Your favorite recipe (in full or via link)? Where do I begin… people who hang up the telephone without saying goodbye. If you could invite anyone to join you for dinner — fictional or real, from the past or the present — who would you invite? Your favorite blog post — from your blog! What is the first toy you remember? What is your favourite item of clothing? If you could have any car (without having to pay for it, the gas, insurance, etc…) what would it be? Name one of your favourite books. Where is your favourite museum? What is the song you have played the most this week? Would you travel into outer space? O my God, I thought I replied! I am always in trouble when I have to decide who to appoint. And then the prize I consider beautiful but do not retreat. You are all very good … I love your photos, all!! There is a lot of class in your photographs … and I fall in love every time the ford. This is my thought for you. Thank you very much. so much emotion, feeling much you mean to me. Glad I could pass it along to you! 1.What is the first toy you remember? 2.What is your favourite animal? Fish, because it’s tasty and healthy. Asian cooking – they often combine the two. 4.What is your favourite item of clothing? 5.If you could have any car (without having to pay for it, the gas, insurance, etc…) what would it be? 6.Name one of your favourite books. 7.Where is your favourite museum? Probably the Salvador Dali museum, but I’m not sure because I’ve never been there. 8.Who is your favourite artist? I don’t know, there’s many good ones. 9.What is the song you have played the most this week? Hebrew course on mp3 is the only thing I’ve listened to the last couple of weeks. – It’s not a year, it’s more a time-period. I would have gone back to the Viking era, to learn about their navigation, music & culture. 11. Would you travel into outer space? Yes, but not for a long period of time. It would have been enough to shoot some photos, so that I could post them in my blog. I am amazed at how many have vivid memories of toys that were lost, stolen or given away by parents who thought their children no longer “needed” them – that must be one of the things that contributes to people being collectors…. Thanks for your answers – Vikings rock! It has been my experience that you’ll receive some type of blog award every few weeks. To keep it interesting,it is better to keep your list small enough so that you have other blogs to pass an award onto for the next time. Leonardo da Vinci for sure would be interested to learn, what actually is surrounding you! He would be glad to use your laptop! He might tell me that he had already dreamt about it! You are most welcome – it takes a bit of time to complete but it is fun! Thank you very much for your nomination of a Liebster Award. I’m not sure how it works, though I checked my stats page and have just over 200 followers. In any case, the fact you did this is very much appreciated! You’re very welcome – this one took more time than anticipated so no need to rush… have fun!